This is an amusing background that resulted from me combining a couple of existing ideas. It was intended as a background for some kind of science fictional wargame, but it would work well for a novel. In any event, it will provide a nice playground for toying with the equations from this website. Here is an Excel spreadsheet with Hohmann orbit information for the Saturn system of moons. There is a table for orbits starting from Saturn's moon Titan at Dave Dietzler website. Somebody on one of the usenet newsgroups asked if combat in the asteroid belt would look like Han Solo and the TIE fighters from THE EMPIRE STRIKES BACK. I answered No, since the average separation between asteroids is approximately 16 times the distance between the Terra and Luna, ships in the asteroid belt might never even see an asteroid. 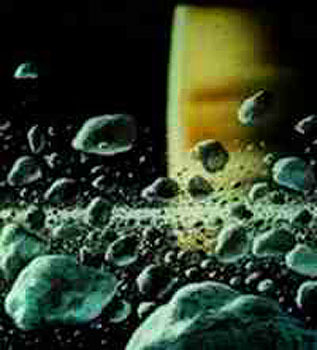 Somebody else said that the only place you'll find asteroids that densely spaced is in the rings of Saturn. Then I remembered the article by Jerry Pournelle in A STEP FARTHER OUT entitled "Those Pesky Belters and their Torchships". A lightbulb went on above my head. Sometimes a star would drift behind the rings, losing only a little of its brilliancy as it did so. It would continue to shine through their translucent material -- though often it would twinkle slightly as some larger fragment of orbiting debris eclipsed it. 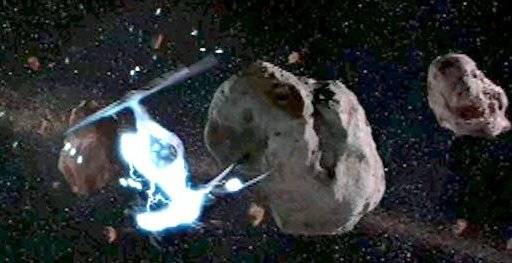 The real reason to use Saturn as the background for a game or novel is because combat in a dense asteroid field is really cool. But we can make additional justifications. According to Pournelle  in a gas giant's system of moons, Hohmann delta V requirements are quite reasonable. This contrasts with the excessive Hohmann requirements for, say, travel among the asteroids. Crude NERVAs using various ices as reaction mass work just fine. 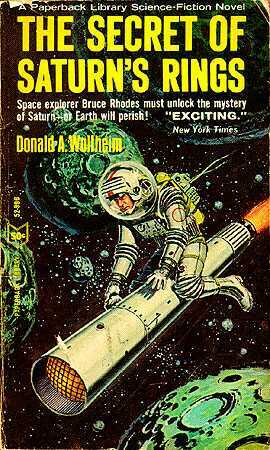 Indeed, in the outer moons, a backyard kerosene rocket will do. Most of the Saturnian moons are almost entirely composed of ices so there is plenty of reaction mass for a fleet of ships. Hohmann transit times are relatively short, as are synodic periods of launch windows. Gas giants are also pretty far away from Terra, to encourage wars of liberation and local autonomy. While Jupiter is closer, it also has a nasty radiation belt. Saturn doesn't. 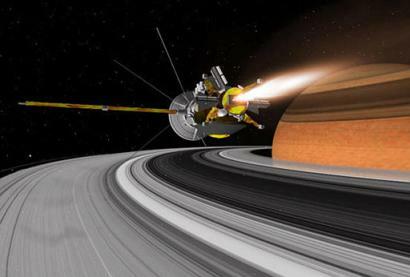 Saturn's radiation belt is far weaker than Jupiter's blue glowing field of radioactive death, being more on par with Terra's Van Allen belt. This would mean that the various moons of Saturn could be independent nations, fighting each other over "whatever" without having to worry about interference from Terra. Created by Erik Max Francis' Python Hohmann orbit calculator. Start and destination planets are labeled along axes. Values below the diagonal in blue are delta V's needed to go from orbit around one satellite to orbit around the other, landing on neither. Values above the diagonal in red are delta V's needed to go from the surface of one satellite to the surface of the other, taking off and landing. Diagonal values in gold are delta V's needed to take off from the surface of a satellite and go into circular orbit around it, or to land from a circular orbit. A backyard kersosene rocket (exhaust velocity 3,330 m/s) with a mass ratio of 2 will have about 2,300 m/s of deltaV, mass ratio of 3 will have 3,660 m/s, and a mass ratio of 4 will have 4,620 m/s. As you can see this could easily do almost half of the possible trips. A NERVA rocket using water as reaction mass (exhaust velocity 4,042 m/s) with a mass ratio of 2 will have about 2,800 m/s of deltaV, mass ratio of 3 will have 4,440 m/s, and a mass ratio of 4 will have 5,600 m/s. A NERVA rocket using hydrogen as reaction mass (exhaust velocity 8,093 m/s) with a mass ratio of 2 will have about 5,600 m/s of deltaV, mass ratio of 3 will have 8,890 m/s, and a mass ratio of 4 will have 11,200 m/s. 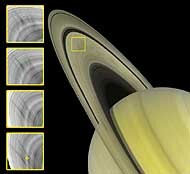 In both sections, "d" means "days", and "h" means "hours"
What is valuable at Saturn? According to Zubrin  fusion power reactors work splendidly with He3 as fuel. The teeming billions of Terra will be screaming for He3. Alas, He3 is almost non-existent on Terra, and rare in Lunar regolith. It is, however, available in enormous amounts in the atmospheres of Gas giants. Hybrid air/space craft could harvest this from the atmosphere. 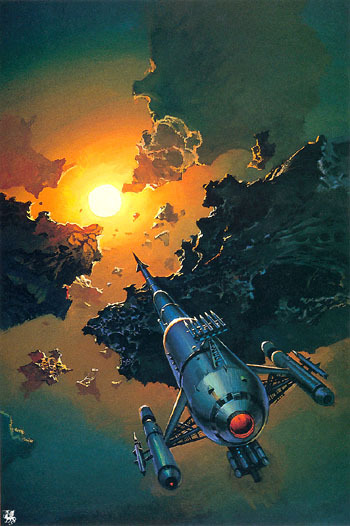 However, using NERVA propulsion, escaping from Jupiter would require an impossible mass ratio of 20. It isn't clear if it is even possible to build a NERVA with a mass ratio higher than 7. Even if it was, a mass ratio of 20 will make harvesting Jovian He3 uneconomical. But wait! A NERVA powered harvester in Saturn would only need a modest mass ratio of 4. 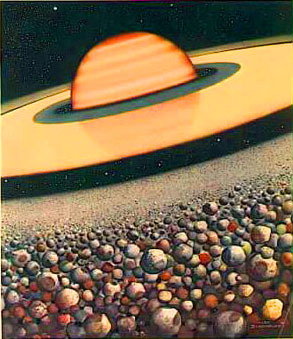 This means that Saturn could become the "Persian Gulf" of the solar system. In other words, we've discovered a plausible reason to colonize the Saturn system in the first place, and the basis for an economy (we will ignore that annoying little man in the front row who just pointed out that Uranus has more He3 than Saturn, and has even less gravity.). According to Zubrin , terraforming Mars could require large crashing ice asteroids onto its surface. The farther out the asteroid's orbit is from the Sun, the less delta V is required to re-direct it to Mars impact. Saturn would do nicely. Most of the ring fragments are solid ice, and Saturn is quite far from the Sun. There will be military bases of all space faring nations, to keep an eye on each other and to prevent unauthorized asteroid re-direction. 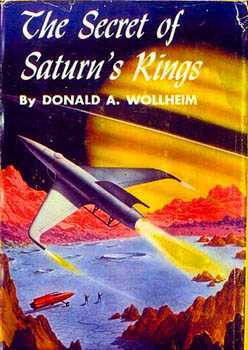 Of course there will be such bases in the vicinity of Saturn. They will probably be indifferent to the political situation among the various moon of Saturn, so long as nobody tries to alter an asteroid orbit. These bases will make the situation more interesting. Boomtowns and settlements would spring up around any large industrial operation and around military bases. Gambling, whiskey, and prostitutes. This will also make the situation more interesting. There might be life on Titan. There will certainly be a scientific base or two full of exobiologists. If the Titanian life is intelligent, there will be a couple of hundred bases. How thick are the rings? There is some controversy about that, but a good ballpark estimate is from 10 meters to 1 kilometer depending upon location (well, originally the estimate was one to five kilometers, but since that was written the Cassini spacecraft has discovered it is closer to 10 meters thick in spot. Yet again a romantic planetary setting has been shot down by cold science). Isaac Kuo throws a monkey wrench into the works by making a case for Jupiter. Alas Jupiter has no extensive ring system, which was the point behind this exercise. But the attractive delta V and synodic periods do apply to Jupiter. Here Isaac is responding to prior comments by Ken Burnside. The common objection to colonization of the Jupiter system is the intense radiation belt, especially the plasma torus around Io. But whereas most people see this as a fatal flaw, I see it as a source of POWER ("POWER", to rhyme with "If you only knew the POWER of the Dark Side..."). As I see it, radiation is pretty much a fact of life in extra-terrestrial colonization. The only places where there isn't a lot of long term radiation exposure is inside the depths of a thick atmosphere, and generally those atmospheres are far less pleasant than just dealing with building a thick layer of radiation shielding. 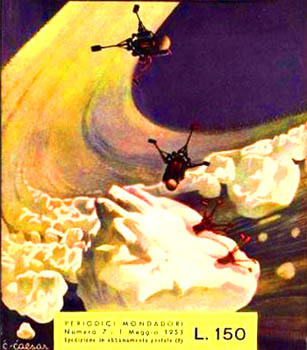 Floating inside a sulfiric acid gas giant atmosphere over an abyss of certain death? No thanks! Titan? About as good as it gets outside Earth, as long as you don't mind the extreme cold and all the cyanide. Engineering a colony to deal with being immersed in a cold atmosphere is more difficult than engineering one to deal with being immersed in a vacuum. So wherever you set up your colonies, those colonies are going to need thick radiation shielding. Once you've commited yourself to that idea, then life inside Jupiter's radiation belts is no longer such a big deal. On the other hand, Jupiter's intense plasma torus provides gobs and gobs of cheap electrical power. Unlike most people, I don't assume a fusion economy so the potential reserves of Helium-3 in the gas giants is of marginal interest to me. The availability of immense amounts of cheap power around Jupiter is what attracts me. Saturn, in terms of travel times (if not Delta V) is far enough out there that it may never get utilized, unless something (akin to He3) is found that's worth the expense to ship it back. This is based on the flawed idea that there needs to be something to ship back. I see Jupiter and the other gas giants as places worth expanding to for expansion's own sake. If there's money to be made back home, its made by offering all of the transport and equipment for the colonists at a price. The colonists earn their wages back home and save up in hopes of moving to a new place for a better life (if not necessarily for themselves, then for their children). There's no particular need for ANYTHING to be worth exporting back home. Yes, indeed. The thing about solar power is that it's pretty expensive, and really pretty restricted to the inner solar system where you've got a limited number of planetoids to exploit. Mercury has a lot of power, but not a lot of raw resources to exploit. The entire asteroid belt has less mass than our own Moon and its inconveniently spread out thinly. Our Moon is big enough that its gravity well is a bother, and it doesn't really have a good mix of resources. The gas giant systems have lots of cheap tether power, as well as lots of nearby planetoids with easy gravity wells to exploit. The mix of resources is very good. But in order to work there, you're going to need shielding capable of near constant immersion in Jupiter's Van Allen Belts, which are pretty intense. While the level of radiation is intense, the actual thickness of shielding required isn't going to substantively differ from what's required for any other space colony. What I somewhat doubt is that you'll get human populations large enough to form independant governments without shirtsleeve environments. I disagree. Once you start building space colonies, there's no particular reason to stop. Antarctica is a less hospitable climate than Mars, and much less hospitable than an orbital colony. The huge enduring problem with living in Antarctica is the pervasive cold. It's hard to keep warm, when the thick atmosphere is constantly robbing you of heat. The fact that you spend six months at a time in the darkness of night doesn't exactly help either. A Martian colony has to deal with a much thinner atmosphere and consequently much less thermal insulation is required. An orbital colony doesn't even have to deal with that. Cultures that are much more communal in nature than Western norms may work best out there. I think that simply cramming people together in densely populated cities has a natural tendency to give rise to more communal mindsets. Whether it's Liberal or Socialist or Communist or whatever...it ain't gonna be no Libertarian lassez faire-yland. When you have a thousand neighbors and it seems like every little thing they do affects you and vice versa, the notion that anyone can do anything they please isn't going to have much traction. You don't need space colonies to see that effect in action. ...and this differs from Western norms in exactly what way? Death Star, er, ah, Mimas. 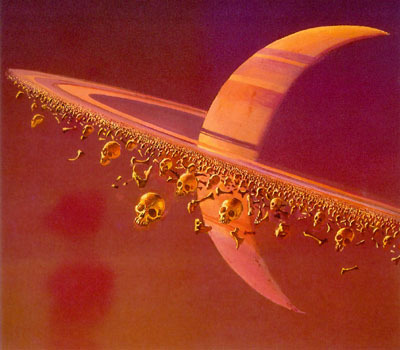 If you do some research on Saturn, you will find that it is a pretty weird place. There are lots of mysteries. As an SF author, you can take any or all of these and develop the Sinister Explanation. What causes the "spokes" in the rings? Why does Saturn's south pole have a giant hexagon? Why does Titan have a dense atmosphere while the other large moons do not? Why is Hyperion so weird? Why are the two hemispheres of Iapetus so different? 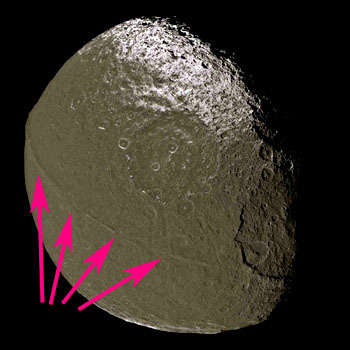 Why is Iapetus' orbit not in the plane of the other moons? Is Phoebe really the source of the dark material on Hyperion and the leading hemisphere of Iapetus? Epimetheus is co-orbital with Janus. Suspicious. 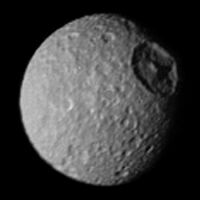 Mimas's "Death Star" crater is suspicious. Telesto is in Tethys' leading Lagrange point. Calypso is in Tethys' trailing Lagrange point. Helene orbits in Dione's leading Lagrange point. 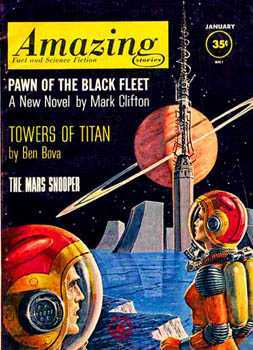 French, Paul aka Isaac Asimov (1958). Pournelle, Jerry. "Those Pesky Belters and Their Torchships." A Step Farther Out. Pournelle, Jerry. New York NY: Ace Books, 1979. Zubrin, Robert. "Colonizing the Outer Solar System." Islands in the Sky. Ed. Schmidt, Stanley & Zubrin, Robert. New York NY: John Wiley & Sons, Inc., 1996.